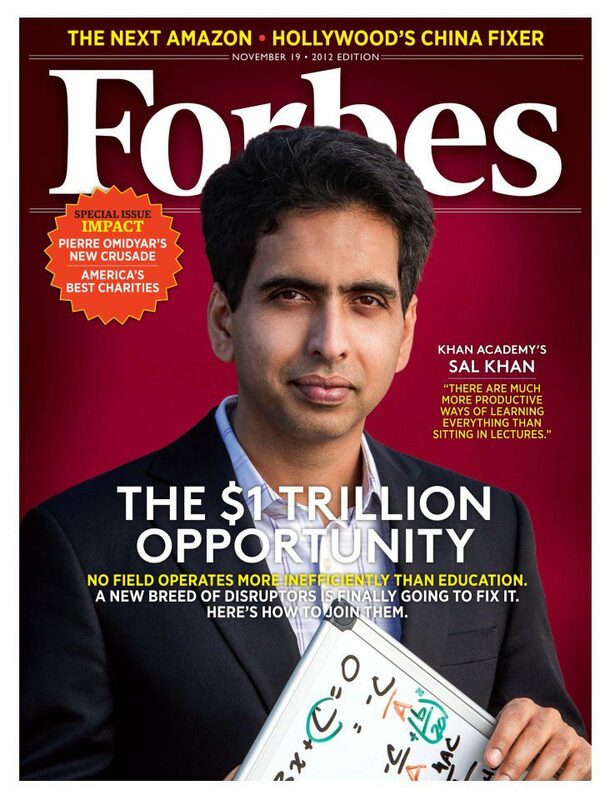 Bangladeshi-American Sal Khan on cover of Forbes magazine. The headquarters of what has rapidly become the largest school in the world, at 10 million students strong, is stuffed into a few large communal rooms in a decaying 1960s office building hard by the commuter rail tracks in Mountain View, Calif. Despite the cramped, dowdy circumstances, youthful optimism at the Khan Academy abounds. At the weekly organization-wide meeting, discussion about translating their offerings into dozens of languages is sandwiched between a video of staffers doing weird dances with their hands and plans for upcoming camping and ski trips. Pivoting, Salman Khan, the 36-year-old founder, cracks a sports joke appropriate for someone who holds multiple degrees from MIT and Harvard. It involves LeBron James (a Khan Academy fan), three-point shots and sophisticated algorithms called Monte Carlo simulations. The company’s 37 employees, mostly software developers with stints at places like Google and Facebook, are the types who know when to laugh. And they do. It’s a prototypical Silicon Valley ethos, with one exception: The Khan Academy, which features 3,400 short instructional videos along with interactive quizzes and tools for teachers to chart student progress, is a nonprofit, boasting a mission of “a free world-class education for anyone anywhere.” There is no employee equity; there will be no IPO; funding comes from philanthropists, not venture capitalists. It’s a fair question, with an increasingly sure answer: The next half-century of education innovation is being shaped right now. After decades of yammering about “reform,” with more and more money spent on declining results, technology is finally poised to disrupt how people learn. And that creates immense opportunities for both for-profit entrepreneurs and nonprofit agitators like Khan. How immense? According to a report from the President’s Council of Economic Advisers, global spending on education is $3.9 trillion, or 5.6% of planetary GDP. America spends the most–about $1.3 trillion a year–yet the U.S. ranks 25th out of the 34 OECD countries in mathematics, 17th in science and 14th in reading. And, as in so many other areas of American life, those averages obscure a deeper divide: The U.S. is the only developed country to have high proportions of both top and bottom performers. About a fifth of American 15-year-olds do not have basic competence in science; 23% can’t use math in daily life. It’s those latter statistics that motivate Khan. The site covers a staggering array of topics–from basic arithmetic and algebra to the electoral college and the French Revolution. The videos are quirky affairs where you never see the instructor (usually Salman Khan himself, who personally has created nearly 3,000 of them). Instead, students are confronted with a blank digital blackboard, which, over the course of a ten-minute lesson narrated in Khan’s soothing baritone, is gradually filled up with neon-colored scrawls illustrating key concepts. The intended effect is working through homework at the kitchen table with your favorite uncle looking over your shoulder. Or make that the planet’s favorite uncle. Over the past two years Khan Academy videos have been viewed more than 200 million times. The site is used by 6 million unique students each month (about 45 million total over the last 12 months), who have collectively solved more than 750 million problems (about 2 million a day), and the material, which is provided at no cost, is (formally or informally) part of the curriculum in 20,000 classrooms around the world. Volunteers have translated Khan’s videos into 24 different languages, including Urdu, Swahili and Chinese. “Sal is the world’s first superstar teacher,” says Yuri Milner, the Russian physicist turned venture capitalist who was an early investor in Facebook, Twitter and Groupon. Beyond admirers like Milner, Khan’s meteoric success has attracted the financial support of a bevy of high-profile, socially minded backers, including Ann Doerr, the wife of billionaire venture capitalist John Doerr; Bill Gates; Netflix CEO Reed Hastings; NewSchools Venture Fund, whose CEO is the former president of the California State Board of Education; and Google, whose chairman, Eric Schmidt, serves on the academy’s board. In total Khan has raised $16.5 million, with assurances of more to come.